Pour three cups of water in a clear bowl along with 25 drops of food color and two spoons vinegar. Now wrap some rubber bands around raw eggs and dip them into the water for at least 10 minutes. Take the eggs out after 10 minutes and allow them to dry. Once the eggs are dry, make a hole in their base with a pin. Afterwards, perforate around the hole and make it wide enough for a dropper nozzle. Make a similar hole at the top of the eggs as well. Now, insert the nozzle into the hole and squeeze the pump, or you can just blow out the raw egg with your mouth. Make sure to either throw away of the raw egg! Take a wide ribbon and make a knot. Take a plastic thread through the ribbon knot and tie a knot on the ribbon. Take the other end of the plastic thread, put it in one hole of the egg and take it out from another one. Now, your ribbon knot should act like a stopper. Now, tie the plastic wire with one of your small tree’s stems. Hand all the eggs on different stems of the tree. You can easily get a small tree or plant with strong stems. You can also use an artificial and ready-made Easter egg tree. Pick one from Personalcreations or a similar online store. Put the tree in a clear bowl filled with sand so that it stays stable, you can decorate the tree further with glitter, leaves etc. 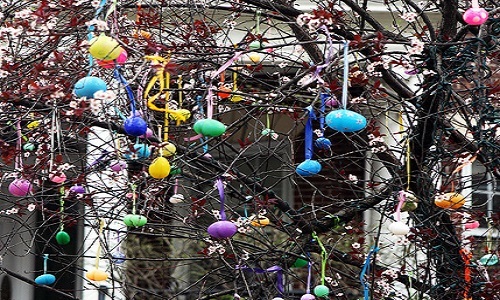 An Easter egg tree can be a part of your East Egg hunt game. It can help especially the younger children who will have a hard time finding the hidden eggs. You can also use this tree as a background for your Easter family photos.